The Market Lady, Lane McConnell, will visit the Webb City Farmers Market in Webb City, Mo., Tuesday, May 15, 2012. The Market Lady and video crew will begin at 11 a.m., with two cooking demonstration incorporating products from the market and will be interviewing producers and consumers for various other segments. Below is one recipe that The Market Lady will be preparing at the market. Be sure and come out to the Webb City Farmers Market on May 15 to meet the Market Lady. Bring broth to boil in medium saucepan. Add couscous. Remove from heat. Cover; let stand 5 minutes. Transfer to large bowl. Fluff with fork. Cool. 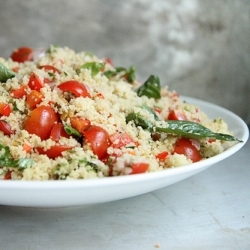 Mix all ingredients except cherry tomatoes into couscous. Season with salt and pepper. Garnish with cherry tomatoes and cheese.